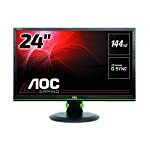 The is an affordable 24″ monitor which is a good option for gamers on a budget. 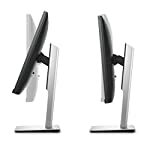 It does have a little brother, the 21.5″ version, but personally I would recommend going for this one, I’ve always felt 24″ is a good size for monitors but of course your taste may well be different. This is the HM model which includes both HDMI sockets and speakers. You might see other versions which lack these so do check the model number carefully, as always, check with your supply if you are looking for specific features. The BenQ GL2450HM has a fairly basic construction, it’s a bit on the chunky side, the stand isn’t the most sturdy and the bezel is far from ultra thin. But, you’re not paying for premium when you buy this one so if that puts you off you probably need to spend some more money. It does include VGA, DVI and HDMI so at least you have a good range of ports to chose from. Inclusion of HDMI also means you can hook this up to a PS4 or XBox One. Viewing angles are limited but this is often the case with TN based screens, you’ll need to angle it carefully to get the best image. Professional reviewers have been surprised by the decent colour accuracy given the low price and TN based panel. Typically cheap panels under perform but this does better than most. It still won’t look anything like an IPS based monitor but again, you get what you pay for. The 2ms response time means that this will do a good job with games. It doesn’t feature modern adaptive sync technology nor can it can display frames greater than 60 frames per second but if you are a casual gamer with a budget then this will get you going. We give the BenQ GL2450HM a 4.5 out of 5 rating. Want to know what existing owners of the monitor think? You can read real user reviews here. 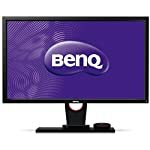 Should I buy the BenQ GL2450HM? 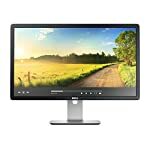 The GL2450HM is a decent low cost monitor. You do get what you pay for, the look and feel doesn't match the level of BenQ's premium offerings and neither does it have quite the same capabilities. But, for a casual gamer who needs a low cost good sized HD monitor, this will be worthy of consideration. It's a best seller on Amazon. If you are having some doubts about this purchase then why not read some real owner reviews and see what other buyers think.